We LOVE these! We have almost 200 of them displayed on our "Great Wall." These complete kits are stitched on 14ct perforated paper, but we've chosen 28ct Natural Linen instead, because we wanted to make them into little hanging pillows! 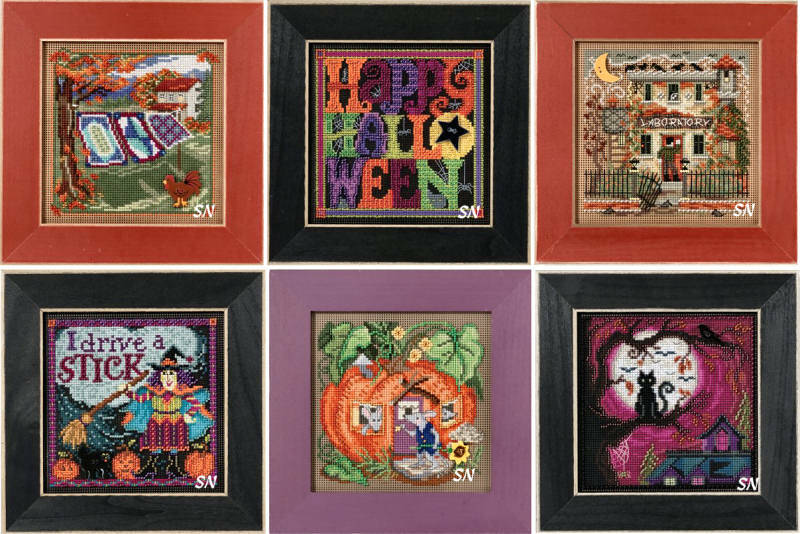 The designs cover the Four Seasons, Halloween & Christmas, Noah, Bees, Bunnies, Patriotic... just everything! 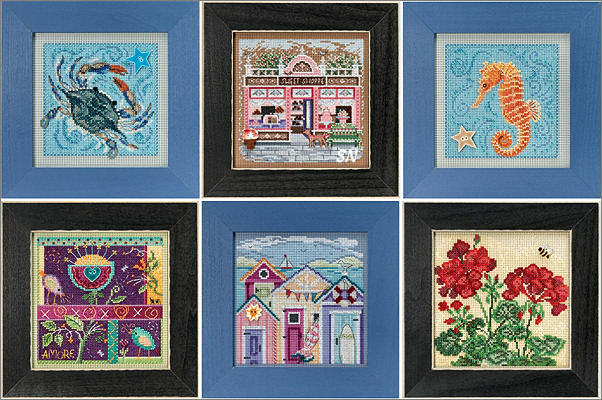 Full of creative bead stitches and details, you'll love them, too! Mill Hill kits are really a good value, because of the variety of things they contain. Each kit uses lots of different colors of glass beads (which run about $1.50 per color), numerous floss colors and ceramic or glass Treasure embellishments (these run between $2.50 and $5.00 each!!!). By the time you purchase everything 'open stock' you would have invested a small fortune. But these little kits are all ready to go... and save the trouble of digging into and pulling from your stash! Whether you choose the Button & Bead, small ornament kits or mini-banded bell pulls... you're assured of accurate instructions, and enough materials to finish your project -- GUARANTEED! Complete kits, except the angels, with the paper: $15 - $17.50 each. 28Ct linen cuts: $7.29 ea. Oh! And don't miss our new Designer's Showcase, where we feature all of the fabulous designs Mill Hill has commissioned as bead kits from outside artists! These are the 5-inch designs that all come with 14ct perforated paper, DMC flosses and a ceramic Mill Hill button embellishment. We always switch out the paper for linen and make little hanging pillows out of them... but however you finish them... they are enchanting! Fairy Garden is full of polka-dot mushrooms and little fairies floating about - a VERY different subject than most of these kits, but it's darling! Midnight Owl is intense - great background on him. Ghost Town looks like an interesting place to visit - but not alone! The sunflowers and pomegranates are bold and eyecatching... and the Foot Bridge is a companion piece to the farmhouses and covered bridges set of designs. It's after January 1st... Spring is on the way!!!!!! (At least that's the Mill Hill business plan!) 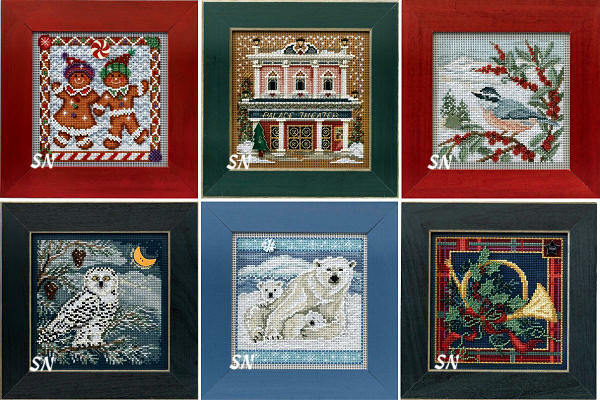 Our annual set of 5 x 5 beaded scenes are here! Complete kits, we always stitch them on fabric instead and make little hanging pillows, but they are also very nice on the provided perf paper.. Drive In is part of the Main Street Everyday Village series of businesses... I think there are about 15 in this collection so far. Valentine Heart is something new for February! Hibiscus goes with the Hydrangea and Geranium we already have, and Flamingos goes with the 6 seashells and crab we already have. Complete kits offer chart, perf paper, needles, floss, beads and button embellishments. Frames are offered separately, as well as our 9 x 9 28ct fabric cuts. 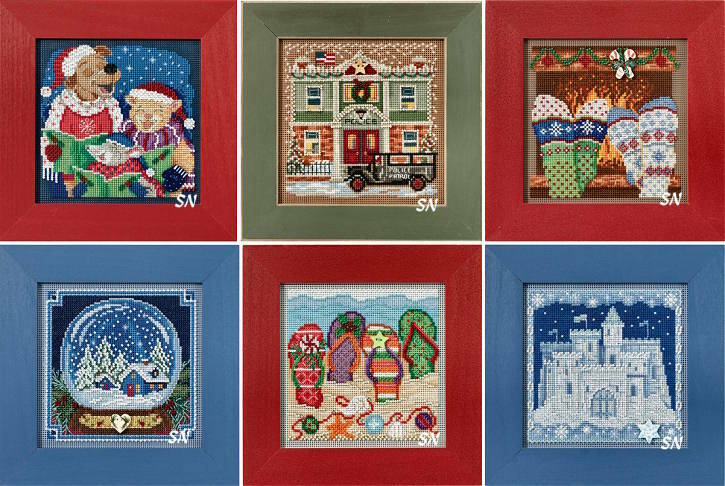 Presenting the 2018 Mill Hill Christmas Bead Kit Collection! 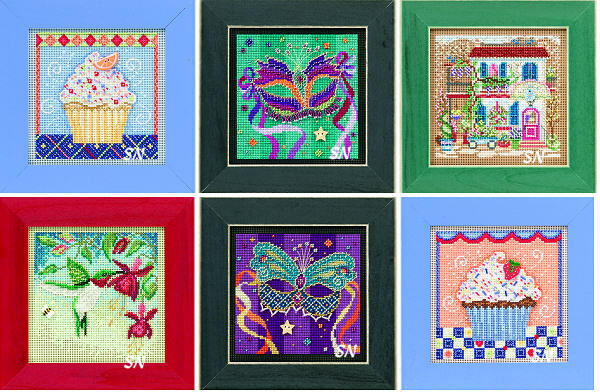 These are the favorite 5 x 5 designs stitched with DMC and beads on 14ct perforated paper. We stitch our shop models on 14/28ct fabric instead... but either way these are fun to work up, and super on eye-appeal! Complete kits contain the chart, paper, flosses, beads and a button. Merry Little Christmas and Brightly Shining are a pair -- hang them side by side. Penguin friends are decorating their igloo... I LOVE that cabin-in-the-woods -- complete with happy snowman in the yard, and the ornament trio is glisteny and elegant. The Cobbler Shop is this year's installment to Mill Hill's village series, and it's cute. 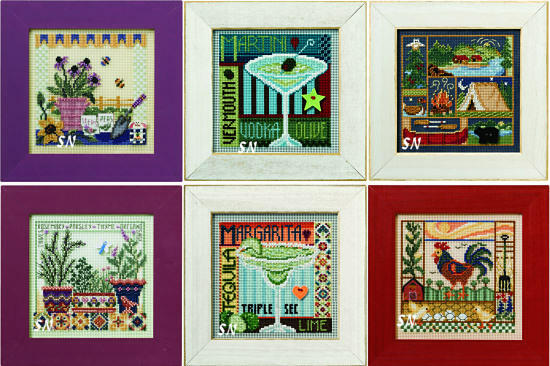 Here is this year's set of these charming 5 x 5 beaded and stitched designs! This year, we have some different designs... the Wanda'a Wands shop features glow-in-the-dark thread! All presented as complete kits of chart, DMC flosses, needles, Mill Hill glass beads and a button for garnish, along with a cut of 14ct perforated paper. These are the 5 x 5 designs that come fully kitted with perforated paper, DMC floss and tons of glass beads and a ceramic button garnish. We always do ours of Aida or Linen instead so we can make small hanging pillows out of them, but they look pretty good on that paper and framed. The beads catch the light - just makes them glisten! Crab & Seahorse companion the 4 seashells we have already: Conch, Starfish, Nautilus and Sand Dollar. GORGEOUS bead colors. Sweet Shoppe is the latest Main Street design - we have about a dozen Spring/Summer businesses (like the Christmas Village) - pet shop, needlework shop, tea room, bridal shoppe. That's Amore is FULL of cheerful color. It's all relaxed and funky - I love it! Geranium is companion to last year's hydrangeas and the pretty wren and coneflower we already have. Gorgeous colors... consider custom framing these with expensive matting... we've seen that and these are KILLER! 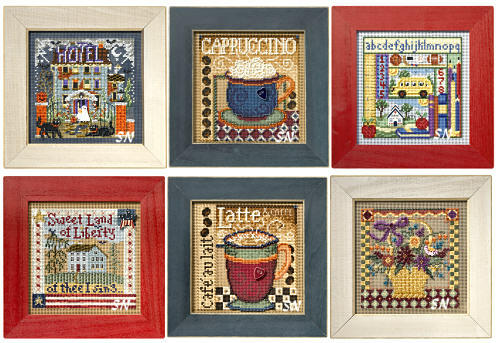 Mill Hill is debuting a quartet of designs all stitched on 16ct Aida and garnished with their beads! as The Children Were Nestled in their beds. A Jolly Old Elf appeared and left gifts for all the good girls and boys. Then as quick as St Nick appeared, he could be seen flying away saying To All a Good Night! You can follow the favorite poem with each of these! 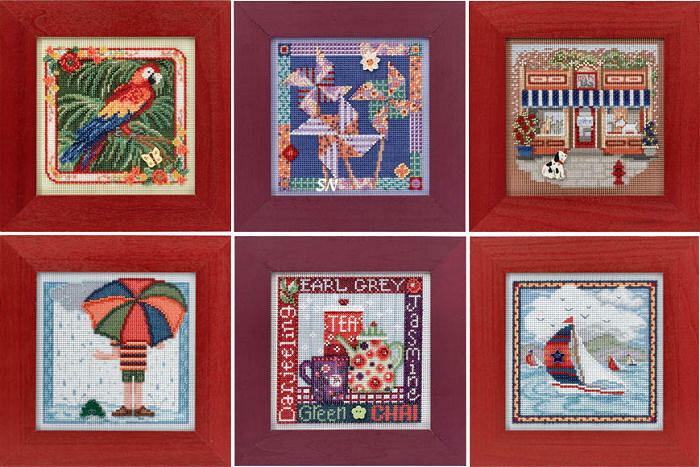 Offered as complete kits of the 16ct Aida and Mill Hill beads, each finishes approx 5-1/2 inches square -- the same size as the regular Mill Hill Button & Bead Kits. These are different for Mill Hill - and promise to be really fun to stitch! Their classic kits -- these are worked in 28ct Gumnetal linen with DMC flosses. I don't think there are too many beads in any of them... just the backstitches and straight stitches that make up the charm of the hand-drawn chalk-art look. Finishing approx 5 x 5 or 5 x 7... give them a try! Enjoy the Mill Hill series, Mighty Oak! You'll enjoy seeing the Mighty Oak go through the change of seasons. Children enjoy making a snowman under the Winter Oak. As the weather warms, the kids enjoy flying their kite under the Spring Oak. Reading under the shade of the Summer Oak is a welcome treat from the summer heat. Lastly, the beautiful leaves on the Fall Oak finds a trick or treater and her dog waiting for the rest of her friends to show up and play. 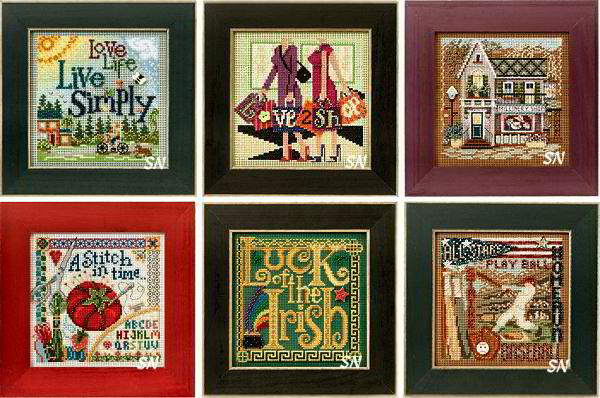 These finish approx 5 inches square. 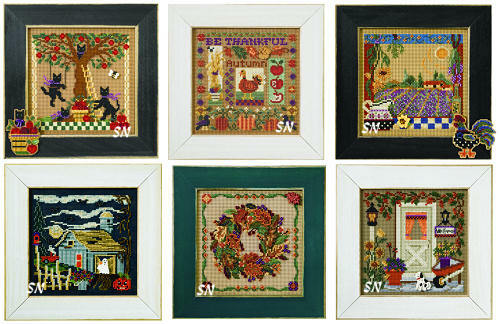 Each complete kit comes with 14 Aida, DMC floss, mill hill beads and the chart. Pretty to choose just one season if it's your favorite but fun to switch out the seasons and keep that little nail on the wall the full year round! 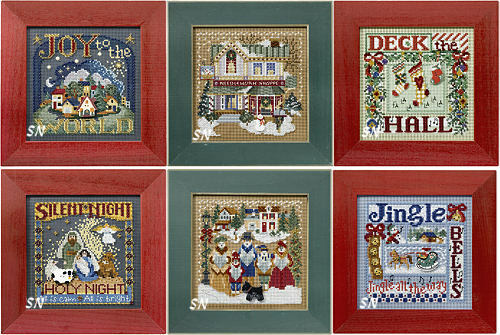 Christmas is just around the corner -- Start Stitching!!!! The annual Mill Hill B & B kits are here. 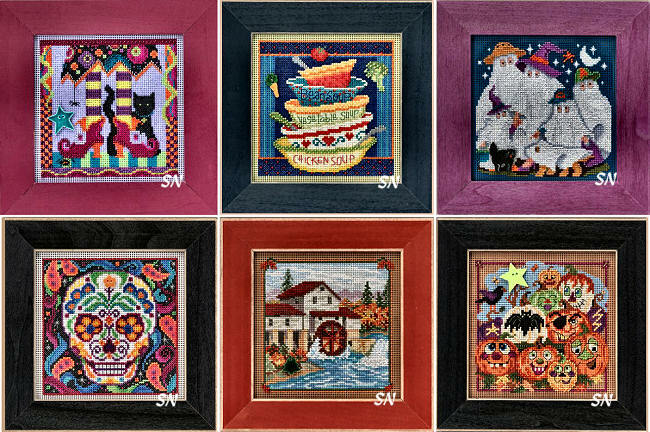 Always 5 x 5 when finished, always worked on 14ct perforated paper (we sub aida and linen for OUR models), and always full of lots of glass bead decorations and colorful DMC flosses, they are perennial favorites! The Police Station is the addition to their Christmas Village series... and that snow glove is pretty darn CUTE! 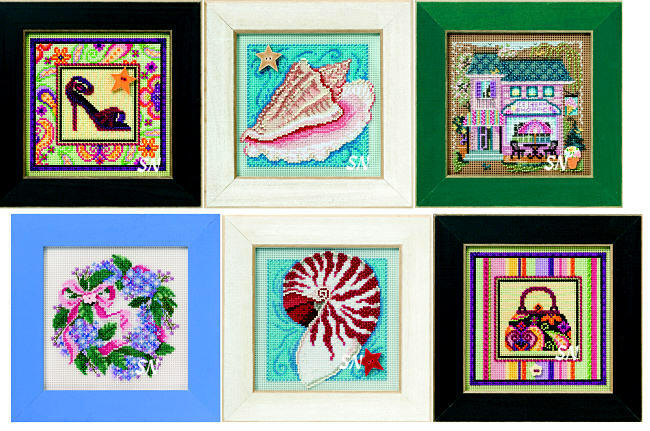 Offered as complete kits of chart, paper, beads and threads -- a great value! NEW Fall Mill Hill is HERE! 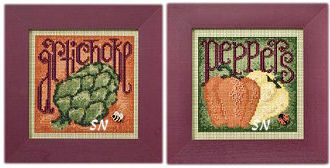 The New Button & Beaded Kits -- These are the 5 x 5 ones stitched on perforated paper with DMC and beads. We like that paper, but we also use 28ct linen or 14ct Aida as alternatives. Each kit comes with all the threads, beads and a ceramic button for garnish. ALWAYS Cute: Harvest Corn can stay out for several months, Country Store is another in MH's Village series (there is a whole Christmas City, and another that are shops through all the seasons.) Spooky Scary features dancing skeletons -- very different and cute! 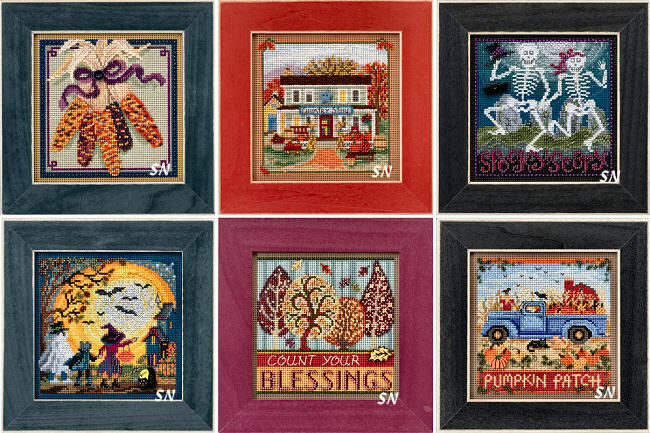 Moonlit Treaters features that awesome moon that several of the previous designs have as well, Count Your Blessings sports the most gorgeous Autumn trees in their colorful glory, and finally Old Time Harvest has that cool old truck perusing he pumpkin patch! 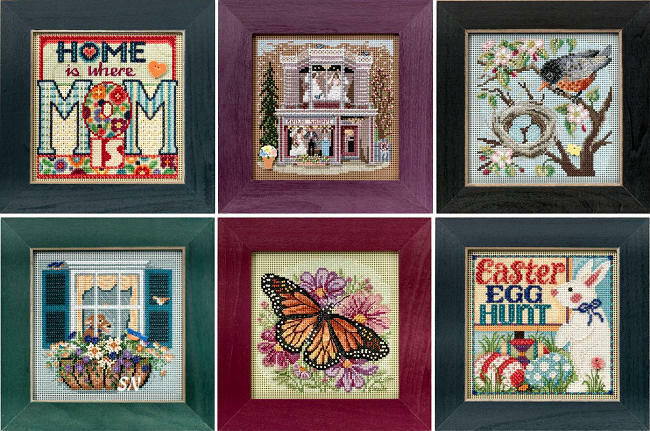 Colors are always gorgeous with these... you can't go wrong for the value of these Mill Hill kits... we've been treated to Winter & Christmas, Autumn & Halloween, Spring & Summer designs for over 25 years now!!! I love the Carrot Patch, the goldfinch goes with last year's hummingbird and monarch, Fabric Shoppe is another in the springtime village of businesses (tea room, haberdashery, pet shop... there are a lot of these NOT Christmas), and Hydrangea is so pretty. My favorite, however, is LAUNDRY. How cute is that? Every laundry room needs this! But isn't it funny... do they even make soap powder in a BOX anymore? Nobody under the age of 30 irons anymore! My grandma had a washer like this... I remember the wringer... I thought her arm would go through there! Mill Hill for Winter of 2016 is here! This year's annual 5 x 5 designs have arrived -- lots of different looks this year. Offered as complete kits of the 14ct paper,all the beads and tons of flosses... stitch these on the provided paper, or switch to linen like we do in the shop. Make small hanging pillows, or go for more drama - these custom frame beautifully -- they can really look elegant with a little tender loving framing care!!! North Pole -- Lots of movement in the snowdrifts and the chilly evening winter sky -- quiet and cold! 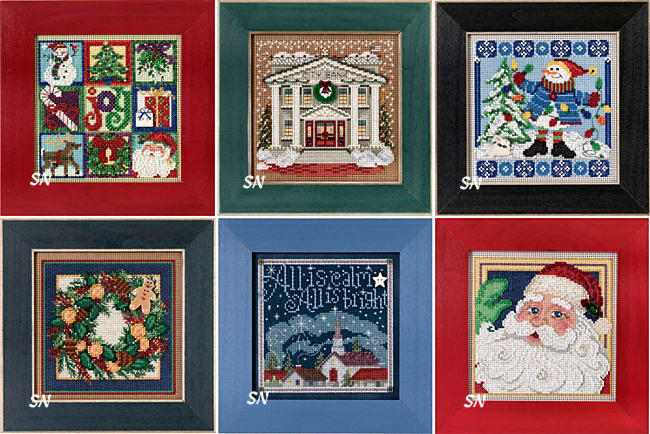 Holiday Sampler -- Here's one of the different looks this year -- a coverlet-inspired sampler... add your family initials... maybe do something with that year -- like change it! Festive Pines -- Very pretty -- the background of this is stitched in deep navy and greens. It matches our French Horn from a couple of years ago. Crystal Snowflake -- Crisp white and winter blues -- very elegant! Winter Stag -- Another of the very different looks this season, I like all the swirls in the background. Our annual set of Autumn designs from Mill Hill is here... I think they have been doing these for us for 25 years now -- but maybe even more than that!!! We LOVE 'em, and so do you guys! Always presented as complete kits, they are loaded with DMC floss and glass beads and a Mill Hill hand-made (we've seen the sheets of clay they cut out, and the kilns they bake them in!!!) ceramic button embellishment. Always finishing the same size -- 5 x 5 on 14/28ct -- we do our models on fabric rather than the provided perf paper, because that's the way we started 25+ years ago... and we're not changing!!!! Our favorite this time is that Moonstruck Cat -- look at those awesome sky colors! And the Haunted Laboratory -- Frank is at the front door -- only he's KNOCKING BEFORE HE COMES IN! (what's up with that??!) Cute and colorful, the complete kits contain the chart, 14ct paper, flosses, beads and buttons. 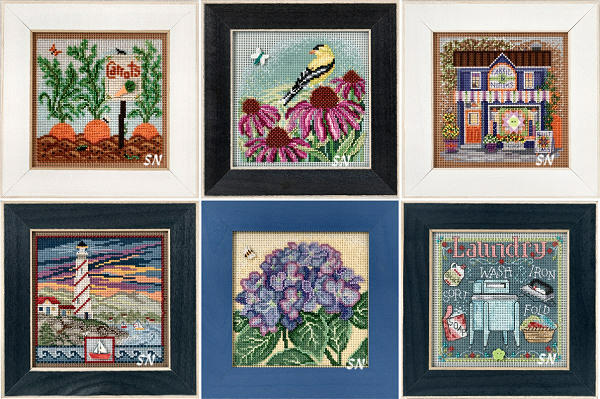 Mill Hill's 2016 Spring Bead Kits! Just in time for hot summer stitching... we hope the subject matter will keep you cool! 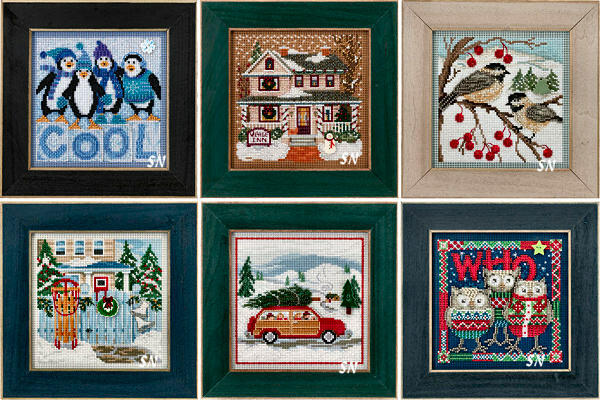 Mill Hill's annual release of 5 x 5 designs for the Christmas season have arrived. Offered as complete kits of the pattern, 14ct perforated paper, tons of DMC floss and all the necessary beads... this is like the milliionth year for these... and everyone still looks forward to them! Use the paper in the kits, or substitute 14ct aida or 28ct linen... the beads really glisten against your stitching. Jolly St Nick is just plain charming!!!!!! Our new bead kits are here!!!!!! Always oh-so-darn-cute... Mill Hill has been delivering us these awesome kits for almost 25 years, I think! Offered as complete kits, you get the 14ct perforated paper, all the DMC flosses, Mill Hill ceramic buttons, tons of MH glass seed beads, and the necessary needles. We LOVE them! You can stitch on the provided 14ct paper, or choose 14ct Aida fabric or 28ct Linen instead -- frame the paper and pillow the fabrics! ALWAYS colorful and fun to work up! Magic Shoes is bright and colorful -- love that skirt! Soup bowls isn't necessarily Fall... but it's a cute kitchen design. Ghost Family would be fun personalized with family names on the ghosts -- different hats on all of them. The Sugar Skulls celebrate the Mexican holiday -- Dia de la Muerte -- when families gather to remember passed friends and ancestors. Painted Pumpkins is full of Halloween silliness! This season's set of designs -- this has to be at least the 25th year for these kits -- they are always fun to see! Offered as complete kits of 14ct perforated paper with Mill Hill glass beads and tons of flosses and a ceramic button embellishment, they are an awesome value because everything is there... and they always use tons of colors of beads and thread. MOM -- Get this for a beginning stitcher you know -- she can get it finished before Mother's Day! Bridal Shoppe -- We have a MILLION different shops in this series -- both Christmas-themed, and some with a more Springtime flavor. Tea Room, Flower Shop, Pet Shoppe and an Ice Cream Parlour... not to mention all the Christmas ones! Spring Robins -- Just a pretty Springtime decoration! Egg Hunt -- We like this one! a 'Retro' feel, bold graphics and color, this would be neat finished into a cube stand-up or something flat perched on an easel. Always a treat to stitch, this year's set of classic Christmas offerings begins with that darling pair of Gingerbread cookies and the very classic French Horn piece. Next is the Palace Theater -- the next building in the Christmas Village set of houses -- add this one to your village of stand-ups. The other three feature winter wildlife and are stunning! The Nuthatch bird companions last year's Chickadee, but the owl and bears are new winter-y options. Each design is offered in full kit format with 14ct perforated paper, all the necessary beads and flosses, and hand-painted button embellishment. JUST in the nick of time to get you ready for this Fall... Mill Hill has sent their newest Button & Bead kits! We love these... 5 x 5 classic designs that are worked on 14ct perforated paper with loads of DMC floss and MH's glass beads... they are always super eye-catching. Our shop models are all on linen... because we like to 'pillow' these instead of framing them. Complete kits include the charts, paper, flosses, beads, a button and needles. County Fair has the prize pie, pig, quilt, flowers and jams!! Peek-a-Boo Pumpkin has a wild pumpkin -- neat border on that one. Harvest House fits into MH's Country Lane series of houses... a village of houses and businesses that is year round -- not the Christmas Village. Ravens is bold and full of personality -- everyone always likes the ones that feature that moonlight and shadowy sky. and Wanda's Witchery has a black kitty hiding in the potion room! This year's selection of 5 x 5 Bead and Button Kits has arrived! Always on 14ct perforated paper, always colorful, always stuffed FULL of flosses and beads, I think this is the 25th or 26th year for these little guys! We have a colorful parrot -- he needs to hang somewhere tropical! Pinwheels looks like a patchwork fabric swatches. Pet Shoppe is another in Mill Hill's Springtime Village Series. Rainy Day features a big 'ol umbrella -- it'd be fun to get out on rainy days! Tea Time is fun... I bet we get a coffee one next year! And... Summer Breeze is a gorgeous billowing sailboat scene! Complete kits contain all the paper, threads, beads, needles and instructions. Cool Quartet features a colony of penguins all dressed in their mittens and scarves to keep warm! Pretty icy blue and periwinkle colors. Village Inn is another building in the Mill Hill Christmas Village Collection. Chickadees is just lovely. Soft, woodsy colors, the brown and tan birds stand-out against the fresh snow. Holiday Memories follows that same dusty color scheme -- the soft blue fence, and the tan house, the sled looks real! Family Tree is the third that seems to go with the other two -- I'm still one of those 'real tree people', and this IS still how we bring home that tree! Finally, Who Trio is just the cutest! Such rich reds and navy... if you don't think you can finish the entire thing... we think you can stitch those two front owls by themselves! As always Mill Hill's Bead Kits are an awesome value -- complete kits contain the 14ct perforated paper (think about 28ct linen or 14ct Aida as softer fabric options), all the flosses, beads and button embellishments. Each finishes 5 x 5, and is offered separately. Buttons & Beads -- Autumn 2013! The sunflower is bold and bright -- very classy -- and I love that barn scene! After 20-ish years of annual designs, everyone loves these year after year! Complete kits contain the chart, paper, flosses, beads, needles and buttons. Cats & dogs... the summer barbeque and the markets... we have 6 new designs that remind us of wet Spring weather, and hot summer months. Puppy and Kitty Paws are perfect to hang in a powder room or beside the back door -- to advise all incoming *muddy folk! * The Yard Sale and Farmer's Market designs would be cute kitchen designs... and the Barbeque could hang out in your *outside kitchen. * The Tea Room is another installment in Mill Hill's Main Street series of businesses... look back at past year's releases to find all the rest in that cute series. Each of these is offered in complete kit format of 14ct perforated paper, along with chart, needles, DMC flosses, Mill Hill beads and button embellishments, and finish approx 5 x 5. Actually great bargains... these are full of colorful stitching and bead detail. 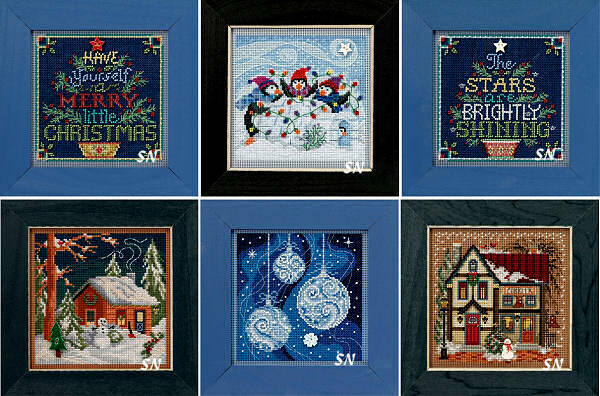 Presenting Mill Hill's 2012 Christmas Button & Bead Kits! 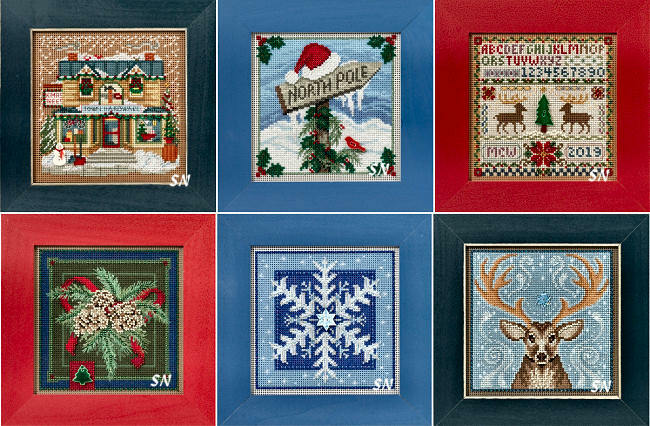 Our walls overflow with these colorful holiday designs -- we just love them! 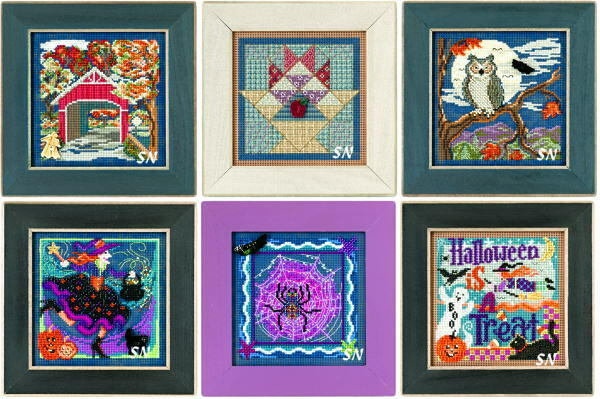 Mill Hill's 5 x 5-ish Button & Bead kits are here, and quite a nice collection this year. *Home for the Holidays* is mainly green and white -- very welcoming. We have a Barber Shop and Book Store to add to your Christmas Village scene... (think there are at least 18 or 19 different houses now!) 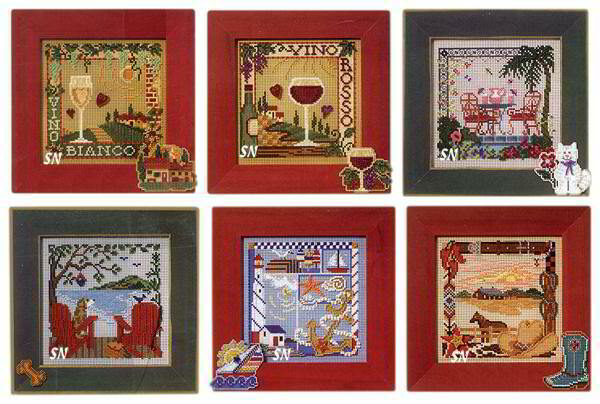 We've seen gals who've finished these into stand-up cubes and actually arrange them on the mantle as a little village! *Tapestry Noel* is a yummy one -- it looks velvet-y, or like a rug -- solid and elegant. *Santa's Treats* is the Peppermint Cocoa one... we don't have any designs like this one, it'll be a cute kitchen decoration. Finally, *World Peace* is also unique in both design and color. A gorgeous dove offering greetings in several languages. All are offered as complete kits of charts, beads, flosses and buttons stitched on 14ct perforated paper. We've always stitched our shop models on linen, but they are pretty any way you work them! 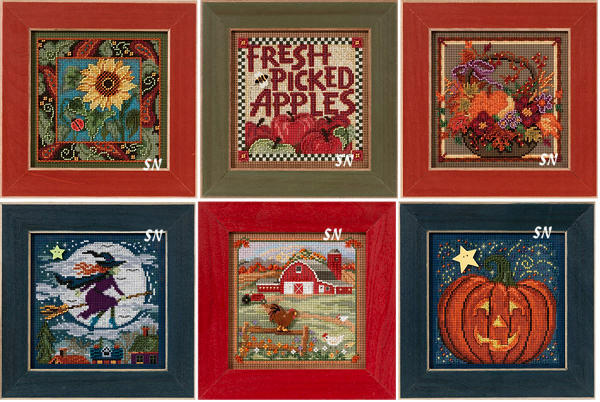 Mill Hill's Fall 2012 Bead Kits are HERE! What a fun grouping of designs we have this year... The Covered Bridge is classic Autumn, you can leave it on display for several months. Fruit Basket Quilt companions their Log Cabin Quilt piece from last year. Soft denim and brick color, it's really pretty. The owl is cool -- he has a matching miniature in the smaller bead kit selection, along with a squirrel and gourd assortment. We love the Halloween styles this year -- the spider web is purple and amazing! The swirly witch matches it, and the Halloween is a Treat is just darn cute. All are stitched on navy blue this time around -- these kits come complete with charts, beads, flosses and buttons, and the blue perforated paper. We like ours on linen... so have those additional cuts available, too! Mill Hill presents their Spring 2012 Button & Bead Kits! If you've ever seen our shop display, or visited one of our booths at a show, you know how much we love these projects!!! Always offered as complete kits loaded with floss and beads -- we always take out the perf paper and stitch our models on aida or linen! They just glisten, and catch the eye. Live Simply is a colorful, summery scene, I picture it in a kitchen, or maybe hanging in the hallway near the back door and all the jackets and keys -- kind of a reminder of what to do when you leave the house! Love 2 shop -- *don't know a soul* that this fits!!! Millinery shoppe -- this is another in the Main Street Shops and Churches Series of designs. Along with all the (think there are 18!) 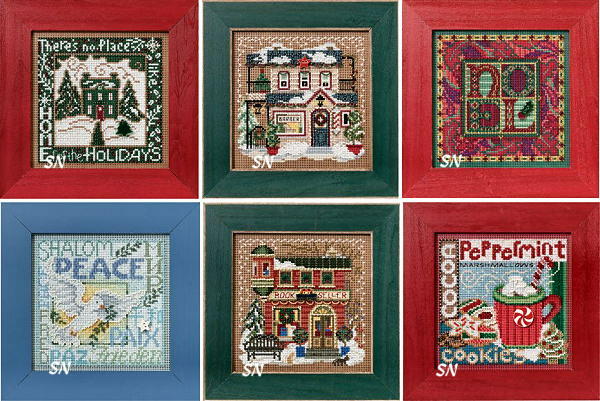 Christmas Village houses, we have a Flower Shop, a Needlework Shoppe, a bakery... these look cool finished into little standing blocks -- to make your stitched village! Stitch in Time is BY FAR my personal favorite this time around! I know THOUSANDS of people that this fits!!!!!!!! Luck of the Irish is strikingly gold and green -- very vibrant in color, and Home Run is a sports-fanatic's dream! It companions the Football design from last season -- very classy in design and color. All of these finish approx 5 x 5 on a 14/28ct. You can use 14 aida or 28ct linen, or the 14ct perforated paper that comes in the kits. 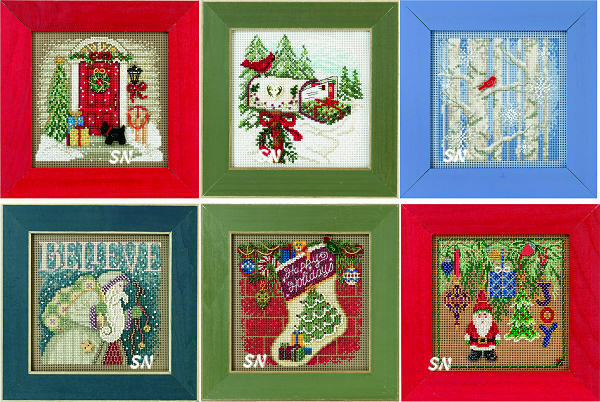 A nice selection this year -- check out the smaller 3 x 3 ornament-sized kits -- they all coordinate with these! In my opinion, these are some of the best they have EVER designed!!! 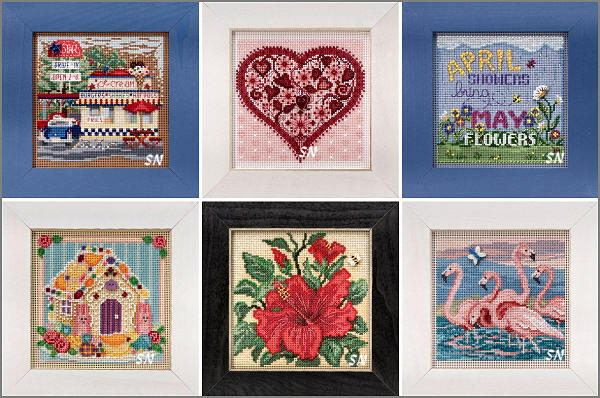 The classic 5 x 5 designs that are offered on 14ct Perforated Paper using DMC floss and Mill Hill seed beads, all six this year are going to be favorites! Home for Christmas has that pretty front door -- with family Scottie Dog! Holiday Delivery features an old fashioned mailbox with SNAIL MAIL cards and festively wrapped gifts!!! Winter Woods is a frosty blue and white forest scene. They have two other blue and white designs like this -- wow, they are eyecatchers! Look at that bright red bird button on there! Believe is a swirly Old World Santa -- neat sky treatment in the background. Holiday Stockings features the stocking-in-waiting... against the brick hearth, and Hanging Around reminds me of all my tiny glass ornaments! See the little Santa? He's hanging there from his hook!!! All are offered as complete kits of perf paper, chart, beads, flosses and buttons. We always do ours on 28ct linen, so we can stuff them and make hanging pillows.. Whichever -- this year's collection is STUNNING! 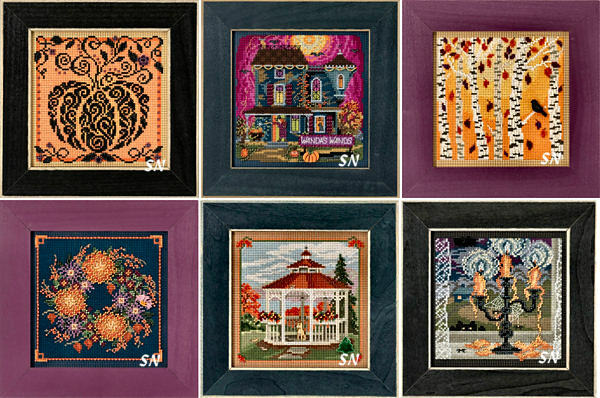 Mill Hill has released their Autumn 2011 Button & Bead Kits -- giving us plenty of time to stitch them before this fall! (gosh, isn't it *still* snowing in NY this week?) 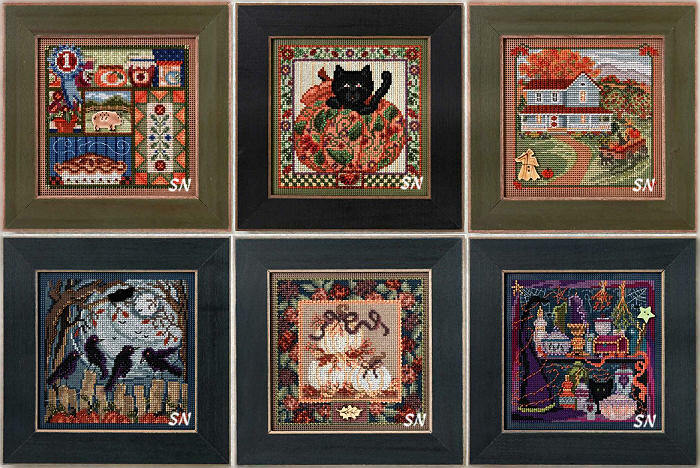 Quite a varied collection this year, we're getting the fall football games and quilts to keep you warm, along with a couple of cute Halloween designs! All finish approx 5 x 5 on the 14ct perforated paper included in the kits -- they'll be the same size if you stitch them on 14ct aida or 28ct linen as well. Melody is a sophisticated black, taupe and red music graphic -- perfect for any musician or music-lover you know. Football Hero is colorful and FULL of family memories -- maybe change the SCORE word to your school colors? Log Cabin Quilt is charming! Can't get your whole quilt finished? I can't believe the details in all those different 'fabrics!' Haunted Mansion continues your Spooky Halloween Village of houses -- we have a library, the haunted hotel, and a few others that make up this growing little town. Wizard is new for Mill Hill, and Moonlit Kitties is stunningly bright! 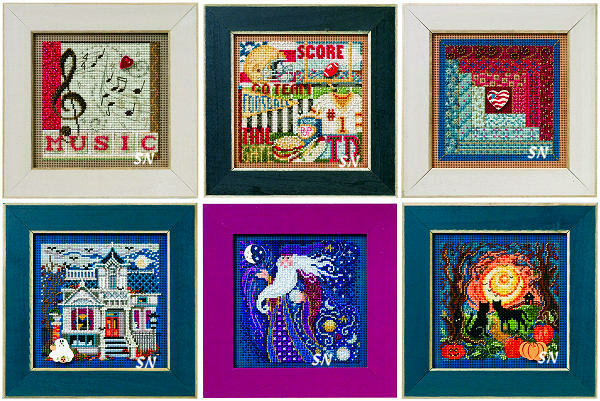 Presenting Mill Hill's 2011 Spring Collection of Bead Kits! 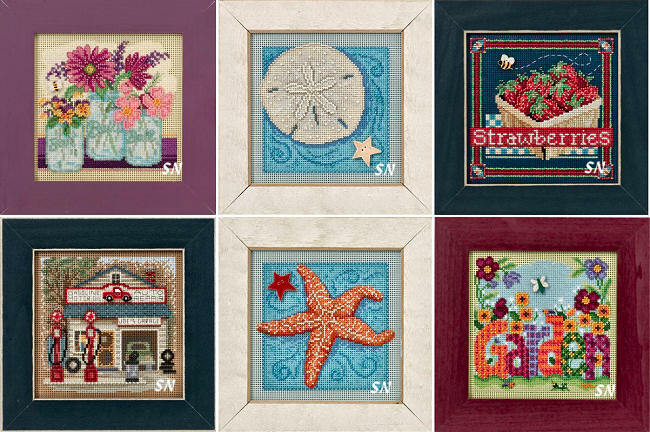 These 6 Button & Bead Kit designs are festive for the Spring! Two Mardi Gras masks -- watch when you order them... the Purple Mask has the Teal background, and the Teal Mask has the Purple background -- totally confusing, but fun anyway! The cupcakes are darling! How about finishing one into a wall hanging that even advertises *Happy Birthday* to a family member! All finish approx 5 x 5, include all the flosses, beads, buttons and charts, and glisten when the lights shine on all those colorful glass beads! Mill Hill's new releases for Spring will be here in just a few days!!! Ice Cream Shoppe is an addition to the growing Christmas Village they have -- I think this is house #15 for that set! The two shells are very 'summery' and need to go with the Margarita, lakeside and Vacation kits we already have! The purse and shoe are bright and fresh -- they need a girl's dressing area, bath, or boutique shop setting! Last in the hydrangea wreath... something soft and pretty! 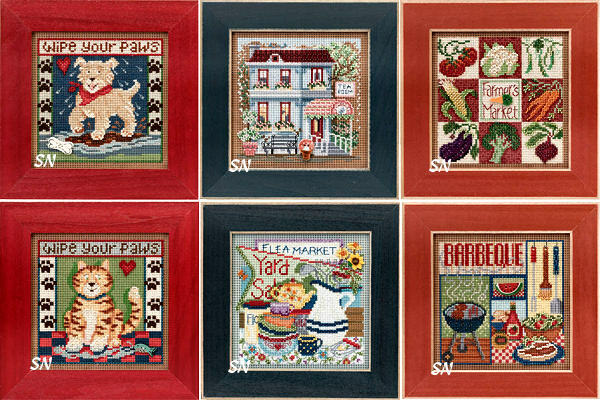 This season's newest Mill Hill Designs are on their way, and your stitching bag is going to need to make room for them! They're all expected to arrive at the end of this week. Some fun and different designs this season... The Clock Repair Shoppe joins the Village series, Let it Snow is a frosty snowflake scene looking out of a frosty window. Frosty seems to go with Let it Snow -- we just love that frosty snowman. The Through The Woods sleigh scene looks so 'retro' and heartwarming, and joins that Village series as well, and the Gingerbread House looks good enough to eat! What an awesome set of 6 new designs! 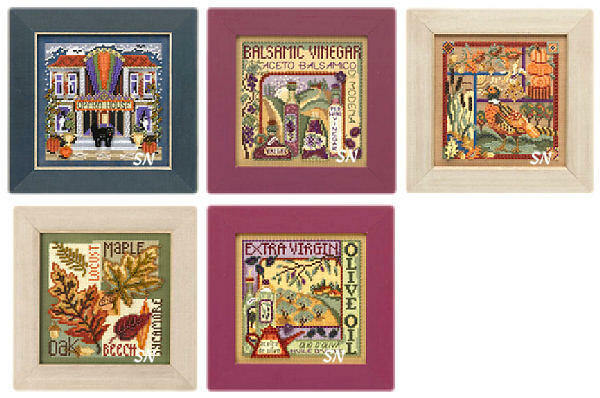 5 x 5 designs full of beaded color and detail, Mill Hill's selection this season are delightful! Always offered as complete kits of 14ct perforated paper, loaded with lots of beads and flosses, the Haunted Library is a companion to Haunted Hotel and the Opera House. 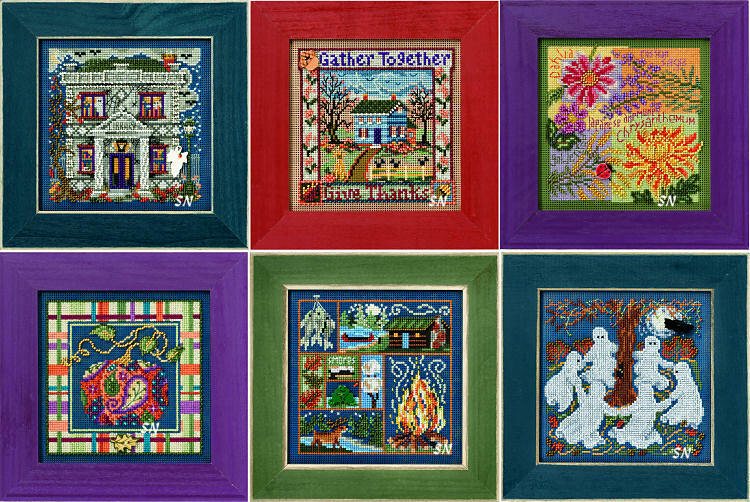 Gather Together is a charming country house scene... those Fall Blooms are like NOTHING we've had so far! Paisley Pumpkin is so darn cute... I'm tempted to stitch it without the border, too. Cabin Fever would make a great companion to 'Camping Out' and check out that ring of dancing ghosts!!! Too darn cute! We always do our shop models on linen, so we can make hanging pillows out of them... if you decide to do that, be sure to mention the specific design, so we can send the appropriate color linen. Six new kits for the season... two join the ever-growing Christmas Village of Mill-Hill-Ville!!!! The Firehouse and front yard snowman building are stitched in the same color palette as the rest of the 14 matching pieces in the set, so now we have 16 total in Millhillville! Next, there are two contemporary florals -- Poinsettia and Mistletoe & Holly -- VERY classy! Winter Wonderland and Christmas Collage are very different for Mill Hill... bright colors, very clean lines -- we think they are AWESOME!! This year's set is eye-catching , and we can't wait to get our shop models stitched!!! All are offered as complete kits of 14ct perforated paper, all the beads, flosses, chart, needles and buttons. At the Silver Needle, we stitch these on 28ct linen and make little hanging pillows out of them... we can sell you that 28ct linen, as well. 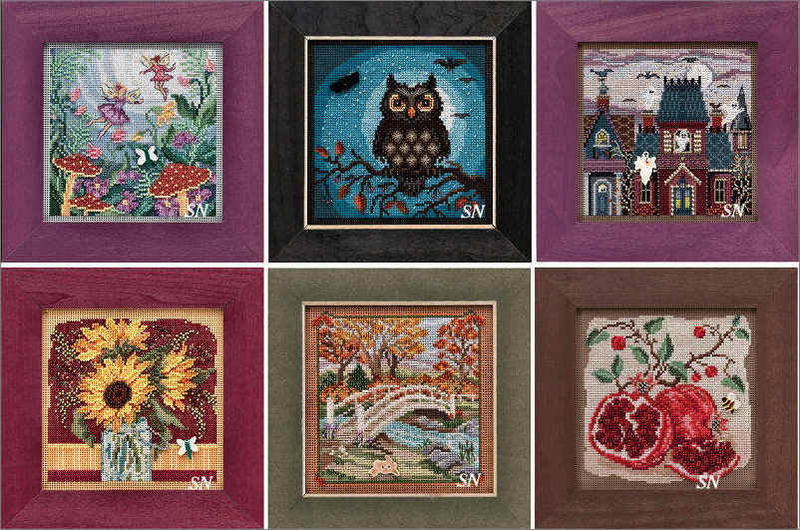 Mill Hill has sent their 2009 Autumn button & Bead Kit designs... and they are a KNOCK-OUT collection!!!! Fall Leaves and Pheasant Sampler are both medleys of rich Fall Color... I can just feel the crisp, cool air! Olive Oil and Balsamic Vinegar - two of my 'favorite foods!!!' - they are stunning against an Italian country-side background! What classy kitchen pieces! Lets not forget Halloween -- we have the haunted Opera House -- it features glow-in-the-dark thread! And, last -- Halloween Night -- all the little creatures gathered for Trick or Treat! Offered as complete kits of 14ct perforated paper, DMC flosses, loads of Mill Hill beads, and a button... these can be worked on the provided paper, or stitched on 28ct linen from your stash, and finish about 5 x 5 in size. This year's collection is stitched on black, moss green and goldenrod papers, so there is TONS of variety. Mill Hill has really outdone themselves with this year's selection of designs... we have 12 more smaller ones to show, too!!! Lovely, crisp, fresh and contemporary designs this year... the colors are delicious... *Very Eyecatching!!! * Offered as the complete kit of chart, paper, flosses beads and button... each finishes approx 5 x 5. Our shop models are always on linen... so we can find some bright, fun colors if you'd like! So classy! 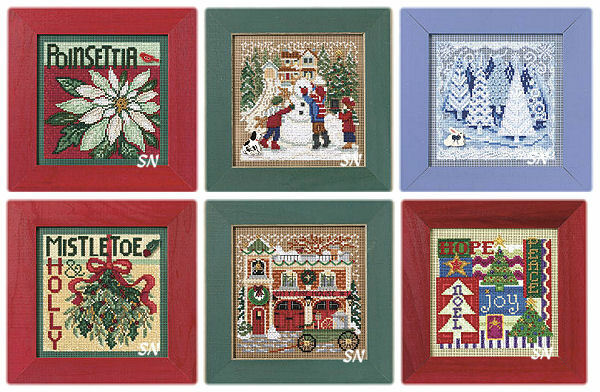 The Christmas Needlework Shop and Holiday Carols! 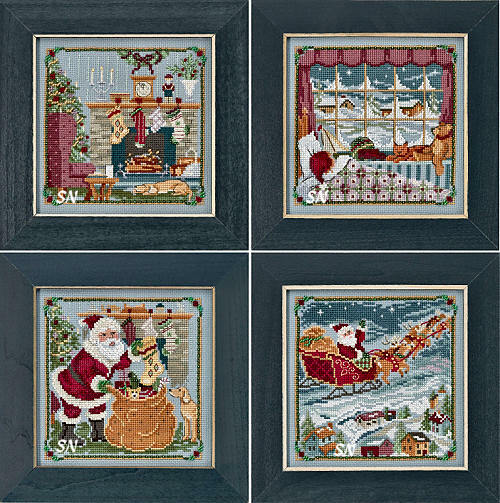 Mill Hill has released the 2008 set of Christmas Button & Bead kits... we've been treated to these for years and years, and this set is one of the BEST! 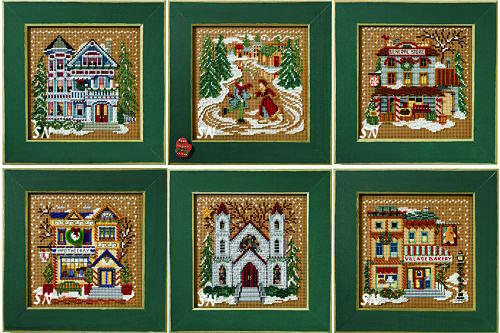 We have two new additions to the 12-pc Christmas Village Series -- Carolers and the Needlework Shop! The four new Carols are stunning!!! Jingle Bells, Deck the Halls, Silent Night and Joy to the World are very eye-catching, and so full of bold design element. Click for even more Button & Bead Kits!